In connection with the trouble caused during a press conference, both, the team of Conor McGregor and the team of Nate Diaz have been banned for the ceremony of weighing. UFC boss Dana White said on ESPN SportsCenter that the consequence of the crazy behavior at the conference press before the gala UFC 202 will ban to weigh in ceremony for the two teams.During yesterday's conference, there was a battle between two gaming teams, and the movement went bottles, coffee cups, beverage cans after the tape roll. Even the Conor McGregor gathered a few cans of the drink and began to throw in the team Nate Diaz, and in turn in the camp Diaz, Jake Shields grabbed the cup Coffee and hurled it toward the Irishman. The long awaited duel of the two effectively fighting guys comes on cage KSW 36. Already on October 1 in Zielona Gora Bartholomew Kurczewski (9-6, 5 KOs, 1 Sub)and Gregory Szulakowski (6-1, 1 KO, 4 sub) will finally clarify their point of view .The fight had to be held already in March this year, but a shoulder injury eliminated "Szuliego" at KSW 34. Since that time, both fighters continue in internet war of words and video materials. Szulakowski returns to the KSW after last year's victory by submission over Patrick Grudniewski at KSW 31. With two more fights at KSW 33 and KSW 34 he was eliminate by injuries. The 29-year-old prepares for battle in Warsaw, one of the best clubs in Poland Olsztyn Berkucie Arrachion. It looks like a really very promising fight! 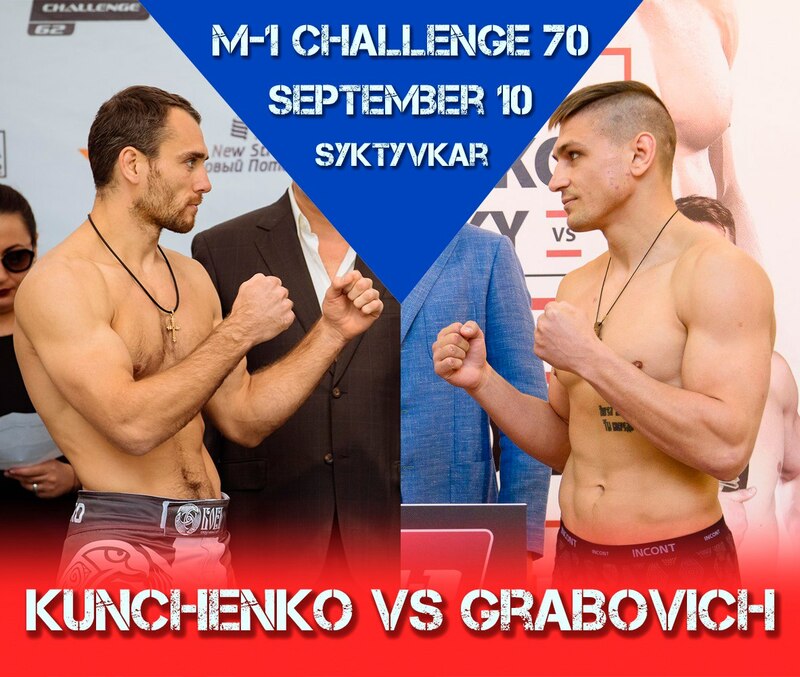 M-1 Challenge 70 is the nearest upcoming MMA event. It is set on Septermber 10 in Russia, in the city of Syktyvkar. The main fight of the evening is a welterweight title fight between reigning champion Alexey Kunchenko (13-0) and Maxim Grabovich (4-1). Initially it was planned to make a rematch between Kunchenko and former M-1 welterweight champ Murad Abdulaev, but unfortunately he couldn't recover from his injuries by that moment. Therefore the young and prospective Maxim Grabovich gets the chance of his career - to become the M-1 Challenge Welterweight champion. The other fighters that are expected to participate in the event are: Andrey Seledtsov, Maxim Divnich, Timur Nagibin, Artem Frolov, Artem Damkovsky and others. It looks like a great event for all MMA fan over the world. Do not miss it!! !